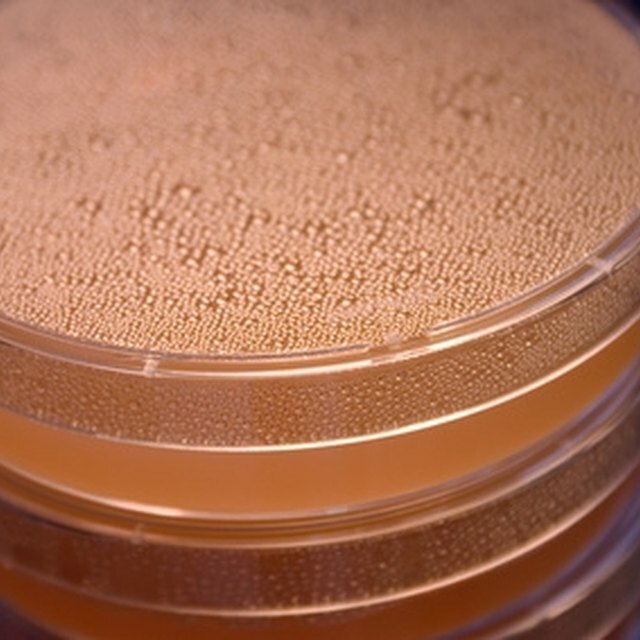 Scientists and researchers study bacterial growth by preparing cultures in a laboratory. Petri dishes containing nutrient agar grow bacterial cultures from a single swipe or inoculation. Students can prepare nutrient agar at home using supplies from grocery or health food stores for a science fair project. Conventional kitchen appliances and basic kitchenware provide the tools to prepare a sterile culture medium that can be dispensed in petri dishes. Following sterile techniques by heating the materials and keeping the surfaces clean and dry will enhance the results by preventing mold and particles from contaminating the culture. Place a coffee filter in a strainer and hang the strainer over the opening of the clear bowl. Slowly pour the broth into the filter, making sure that the broth doesn't overflow from the sides of the filter. If the filter becomes clogged with particles, remove the used filter, replace with a clean filter and continue pouring the broth. Remove the strainer and filter from the top of the bowl and observe whether the broth appears clear (i.e., there are no suspended particles in the liquid). If particles are floating in the liquid, repeat Steps 1 and 2 using a second clear bowl and a fresh coffee filter. Place the pot on the stove and pour the clear broth into the pot. Add 16 ounces of distilled water to the pot containing the broth. Turn on the stove and adjust the heat to medium-low. Heat the broth to a simmer (i.e., small bubbles appear near the side of the pot). Add 1 teaspoon of the agar-agar powder to the simmering broth (approximately 2.5 grams) and stir the mixture until the powder is dissolved. Make sure to stir the powder to dissolve and prevent the gelatin from sinking to the bottom of the pot (where it can burn). Repeat Step 7 until all agar-agar powder has been dissolved in the broth. Continue stirring the broth for about 1 minute to ensure that all powder is completely dissolved. Turn off the stove, place the lid on the pot and let the liquid cool for at least 15 minutes. Arrange the sterile petri dishes in a row for easy assembly, but do not remove the lids.If desired, place a trivet to hold the warm pot. If you're using lidded custard cups instead of petri dishes, sterilize the custard cups by placing the cups and lids inverted (upside down) on a foil-covered cookie sheet and bake in the oven for at least one hour at 375 degrees Fahrenheit. Make sure the sterilized cups and lids are completely cooled before use. Carefully touch the outside of the pot to check that it is warm to the touch and place the pot on the trivet. If the pot is too hot to touch, wait at least 10 minutes to let the pot cool. Remove the lid and set aside. Place the ladle in the pot. Remove the lid from one petri dish and dispense nutrient broth to fill the dish halfway. Cover the dish immediately with its cover. Repeat Step 14 for each of the petri dishes. Allow the nutrient broth to solidify in the petri dishes for at least 1 hour, undisturbed. Gently shake the petri dishes side to side to check that the nutrient broth has completely solidified. If the broth is not completely gelled, wait another 20 minutes before checking again. Cover a table or flat surface with a roll of paper towels to create a sterile work area. Tear off a sheet of paper towel and fold it four times to create a thick, rectangular wad. Set this wad on one end of the work area. Transfer one petri dish to the sterile work area and remove the lid. Carefully turn the dish over and place one end on the side of the folded wad, so that it lies inverted and slightly angled (with a slight gap by the paper towel wad). Turn the lid over and place it above the petri dish on the sterile work surface. If water droplets appear on the lid, gently shake this moisture off before placing on the covered surface, but do not touch the inside of the lid. Repeat Steps 19 and 20 for each petri dish, positioning one side of the inverted dish on the side of the previous dish rather than the paper towel wad. The dishes will appear as a staggered set, with gaps on one side so that excess moisture can evaporate. Look at the inverted petri dishes to check whether the moisture on the sides of the plates evaporated. Once all moisture has cleared, turn the plates right-side up and immediately cover with the lids for use. Inoculate the nutrient agar on the plate by wiping a swab containing the desired culture on the nutrient agar surface before covering with the lid. Turn the petri dish over so that the solid is on top. Store the inoculated petri dish with the solid on top for culturing and the lid on the bottom to catch any moisture, loose particles or growth. If excessive moisture appears on the lids, dry and sterilize the lids in the oven set at 375 degrees Fahrenheit for at least 1 hour (make sure to place the lids in a clean pan lined with aluminum foil before setting them in the oven). Be careful when handling the hot pot to avoid burns. If the side of the pot is too hot, the liquid in the pot is very hot. The nutrient broth should be warm to dispense into the dishes, but not too hot to produce excessive condensation in the petri dishes during cooling and setting. 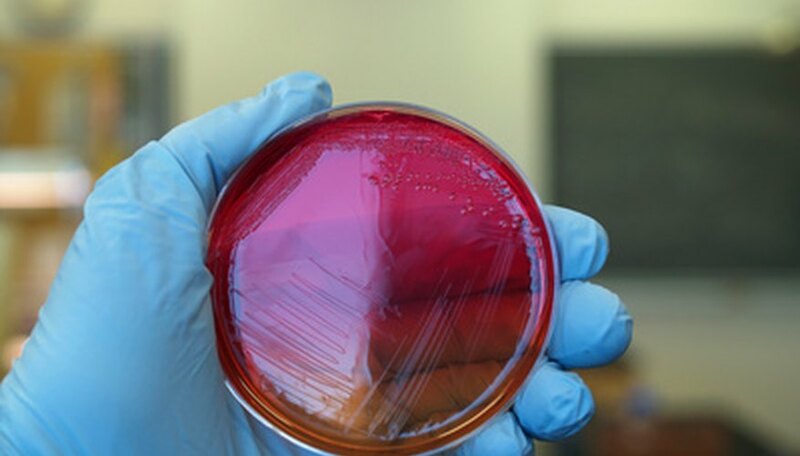 Do not touch the inside of the petri dish (i.e., plate or lid) to avoid introducing unwanted bacteria into the culture. Edwards, Regina. "How to Make Nutrient Agar at Home." Sciencing, https://sciencing.com/make-nutrient-agar-home-6317533.html. 24 April 2017.